Spaghetti and Play-doh= A Very Fun Match! I can't remember where this idea came from. If it was from your blog, make sure to let me know so I can give you credit! It's nobody's birthday, but we got out the streamers anyway- just for fun. I'm a definite glutton for beautiful children's illustrations. Thankfully, there's no lack of wonderful children's pictures. And while I love browsing through the Caldecott winners and honored books (wouldn't it be fun to be part of the committee that decides on the nominations each year?) some of my favorites have been more obscure. Each full page illustration faces a page of text that is decorated with jaunty silhouettes. It really works well as an overall effect. At a conference I attended lately, some members of the audience were discussing how difficult it often is to find serving opportunities for young children. Many ministries have an age requirement for volunteering, and even when they don't make it official, little ones are often limited in the ways they can really be helpful. One lady had an idea that I just loved. She said that she and her children put together plastic baggies full of non-perishable food and first aid supplies to give to the homeless people who solicit for money at the street corners. She just keeps a stash of the bags ready in her car and gives them when the opportunities present themselves. 1. Here in Austin, just about every busy intersection has someone asking for money; so my children are very familiar with the need. Sometimes I've kind of cringed at the way we just keep driving when M looks sadly at the men and says, "They don't have very much money or food to eat." To her, it is very simple; I've wondered if not sharing in those situations plants little seeds of callousness. 2. You can make it as simple or involved as you want it. You can buy pocket versions of The Gospel of John for as low as 30 cents each to include in each bag or they could be as simple as a stick of beef jerky and a pack of gum. It's also great because you can fit the preparation into times that work well for your family. 3. Putting together the bags is something anyone can do- toddlers to adults! Family assembly lines are fun! What other opportunities to serve have you discovered for your little ones? A friend introduced me to Pinterest a little while back, and I've finally gotten around to creating my boards and pinning. So much fun! You can take a peek at my baby, toddler, preschooler, and older children boards so far here. Or follow updates by clicking on the follow button to the right. 1. Trace around a magazine picture with a post-it note, and cut. 2. Glue-stick the picture onto the post-it note. 3. Cut into strips and scramble! Researchers like Dr. Robyn Fivush are studying family narratives and the effects they have on children. What they’re finding is that the sharing of family stories and memories help as the children begin to build a sense of self and construct their own identities, and promote social and emotional well-being. From inspiring stories about great -grandparents finding their way through the Great Depression to the familiar tale of how Dad broke his collarbone while on his paper route, the act of sharing family stories shape who we are, our personal identities, and our connections. They help us bond with our families and find our place in the grander scheme of life. In our "here and now," individualistic culture I think parents fill a deep need in their children when they deliberately help them see themselves as part of something bigger than they are- something that began long before they were born. I love the thought of connecting my children to the parts of their heritage that I would be particularly proud for them to carry on- like sacrificially serving the poor or a history of deep Christian faith . One creative idea Amanda gave for connecting children to family members who have already passed on was to celebrate those relatives' birthdays by "sharing their stories, eating their favorite foods, or giving service to others as a way to honor them." I love it! She also suggests having pictures of ancestors around the house and being ready for the way they spark questions about the stories and legacies behind them. 1. Keepsakes from relatives can be gifted to a child at a particularly meaningful time in his or her life. I have a well-loved, well-marked Bible that was passed down from my grandmother to my mother to me. I look forward to giving that to one of my children someday. 3. Older children can interview their grandparents and write up a report. 4. Memory Books. My mother-in-law was very proactive about giving her parents and in-laws a memory book like this one for them to fill out before they died. I love that the questions in the book included a lot of memories about their parents and that my kids will get to inherit such a wonderful, multi-generational treasure. 5. Family pilgrimages to childhood homes and places of significance to one's ancestors. When I was about twelve it was neat to be able to visit some very old cemeteries in England with the headstones of dead ancestors with my father. 6. Fill out family trees together and giving them a permanent place of display in one's home. 7. Write a storybook with a human interest-type story from your family in it, and read it to your children. For a long time, I have been meaning to write something like this describing our family's apartment fire. I'll include pictures and copies of some of the letters we received during that time. God worked in incredible ways through that incident, and it would be a shame if it were forgotten. 8. Find out about unusual talents or hobbies from your family's past and teach them to one or more of your children. 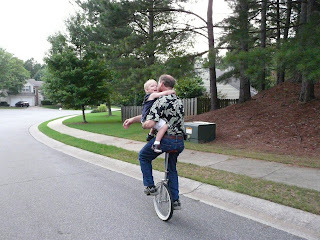 One of my friends has a serious legacy of unicycle riding in her family. I love this picture of the grandfather initiating his grandson into the tradition! 9. Find natural ways to connect your children's good impulses with your family's history. e.g. "It's neat that you want to help the missionaries at our church by _______. You know your Aunt So and So was a missionary to ______. She would have been so proud to see you care so much." Please chime in with stories or ideas you've thought of or implemented with your family. I'd love to hear them! This fabulous set of glow in the dark bracelets is such a great part of Michael's Dollar Spot section. I always keep a set or two on hand because they're cheap and a fun treat for a rainy day. I've blogged here about a couple of fun things we've done with them, but today we tried something new. The girls fished around for them with a long stick in a tub full of sudsy water (they glow better in the opacity, and it makes it extra challenging to find the bracelets). For more ideas about using glow sticks in a water sensory tub visit Play Based Classroom. I always find it so interesting what art pieces children are drawn to. By the end of our little research I had a solution for the bag of clearance Easter confetti that I had bought for 9 cents last Spring. We made confetti mosaics with a glue stick and simple coloring pages. I think the amount of patience required to fill little spaces gave everyone an increase appreciation for the intricacy of ancient art mosaics. In the end, M turned her page into "mixed media" leaving the rooster feathers a mosaic and coloring the rest. And yes, of course, the floor ended up something of an art work in itself! (published in 1928) what in the world is one to do with it? While it is a rather fun curiosity just sitting on the shelf, I decided it would be more fun to turn it into a secret treasure chest book. I remember my mom doing this with an old book when I was a child, and I thought it was very simple and exciting. Fatter books work better because you can make a bigger compartment inside, but this book fit little G's bracelet quite to her satisfaction. M really wants to be able to do those sewing cards made for preschoolers, but they frustrate her and usually end in a sad, tangled mess on the floor. 1. Numbered holes. Otherwise its really hard for her to keep track of where she is- especially because it involves flipping the card after each stitch. She likes the cute little pipe cleaner purse she made! You are looking at the entirety of our birthday presents to M for her 4th birthday this year. There was a part of me that felt like a bad parent for only spending a quarter in the clearance aisle, but then seeing the enjoyment she derived from bopping those yo-yo globe balloons (which she had never seen before) made it feel like the right choice. Sometimes simple pleasures are best- and more easily enjoyed when they aren't crowded. Have you ever opted for a simple gift to a child and then been glad you did? What did you give? I don't know about you, but sometimes a trip to the pool can sound just plain exhausting. When days are hot and you want to save yourself a drive a backyard sprinkler can make a great substitute for swimming. 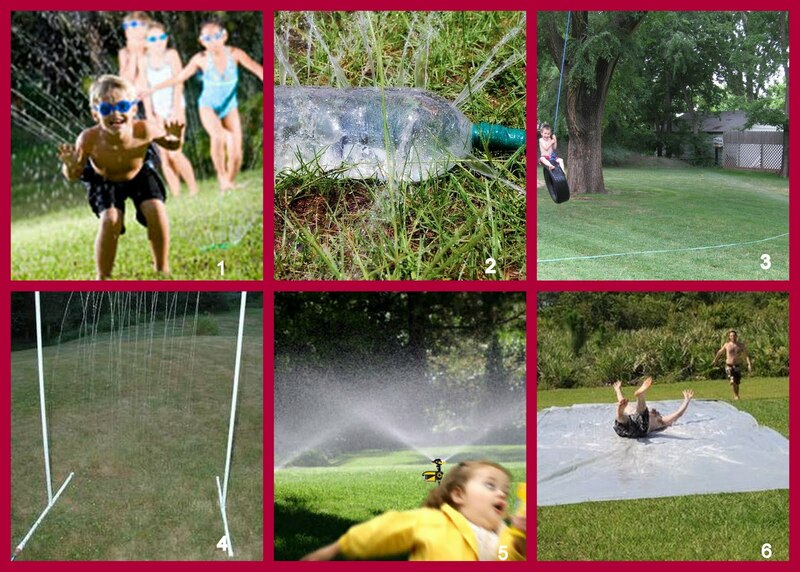 Here are some creative ideas from around the web for making your backyard sprinkler extra fun. 1. Savy Mom explains the rules for Musical Freeze Sprinkler as well as some other fun ideas for a backyard sprinkler party. 2. Kristy Makes shows you how to make a homemade sprinkler out of a hose, a soda bottle, and duct tape. 3. Swinging through the sprinkler on a tire swing like they did over at The Unconventional Doctor's Wife is a great idea! 4. If you are feeling ambitious, you can make some pretty neat homemade sprinklers out of pvc pipe. This model would be pretty fun to ride through on a tricycle. 5. ok, so I haven't heard anyone talk about this as a toy, but Amazon sells a pretty highly rated motion sensor sprinker. It's intended purpose is for scaring away neighborhood pets, garden pests, but would your kids not have fun playing with something like that? 6. Make a fun homemade slide with a clear visqueen, a sprinkler, duct tape, grommets, and some dish soap. 2. The complexity of the language and story was just complex enough to be a little beyond her. It was not so difficult as to cause frustration, but not so easy that she caught everything the first time. That's exactly the balance I look for in a read-aloud. 3. Orphaned children setting up house in an old railroad car is the kind of story that sparks imaginative play. 4. The children model exemplary behavior in natural, child-like ways. The book is not at all moralistic or preachy, but one can't help being impressed with the importance of responsibility, care for one's brothers and sisters, hard work, and resourcefulness by the way the story unfolds. I think I might have read some of the 18 books that follow in this series as a child, but I don't remember much about them. 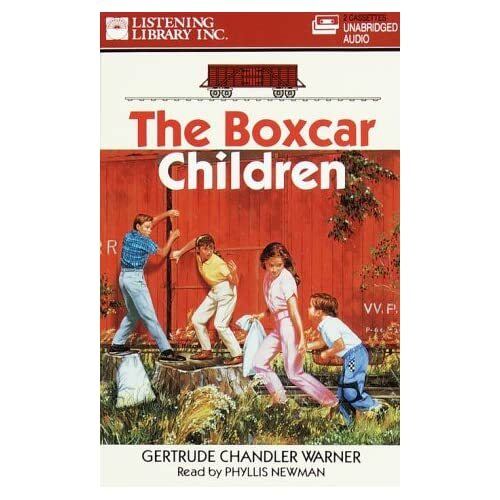 Does anyone have experience with books that follow the original Boxcar Children story? Are they good, or do they become mediocre in that way that is so typical for sequels? Any other good read-aloud recommendations for preschoolers? Heidi at Free Fun in Austin is hosting another one of my guest posts. 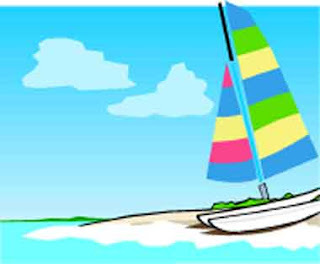 Today the topic is 10 things to do this summer to have fun with toddlers and preschoolers. If you are looking for a quick list of creative summer ideas for school-aged children check out my guest post at Heidi's blog Free Fun in Austin.